Go to the blog administration panel. In the side menu select PLUG-INS. Find the 'cookies advisor' plug-in and click 'activate'. The plug-in message will appear every time someone enters your blog. You can click on 'configuration' or 'tools-cookies advisor' in the side menu to set the text and details to be displayed. At the University you may belong to a particular working group; for example, in your department, service or other such group. If you belong to one of these 'disco.uv.es' working groups in which you share spaces, the group can ask the Servei d'Informàtica (SIUV, IT Service) to create a blog for the group, independent from the blog of each user. PAS adminstrative staff or PDI teaching staff members can request a group blog associated with a disco.uv.es working group. So if a user belongs to a disco.uv.es group called 'algebra', a blog can be set up for this group called http://algebra.blogs.uv.es. 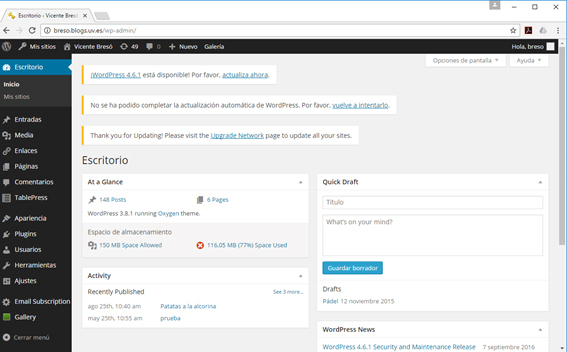 The Servei d'Informàtica (SIUV, IT Service) offers the university body a blogging service based on Wordpress, which allows any UV user a space in which to publish their articles and content without any prior knowledge of webpage design. As University staff, you can start your own blog using any of the default templates. Your blog is public by default and can be visited through a URL on the internet. The username is the same as your UV account username. Each blog is managed and maintained by the user, who must commit to using only non-commercial content, since it is a personal blog. You can add posts, pages, images, links, and all kinds of multimedia. As we explain, the user can choose the appearance of the blog from a catalogue of templates provided by the Servei d'Informàtica as default and which have already been approved. You select the template they prefer for your blog and are essentially responsible for the publication of content (and to a lesser extent for the design). 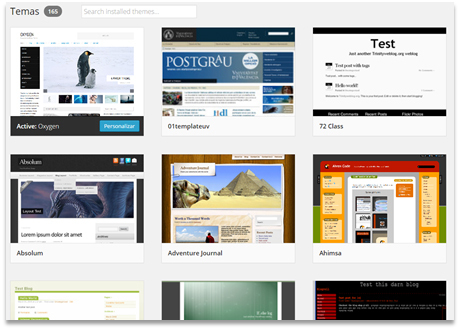 There are also a number of available plug-ins and widgets that give the blog added value. You can manage your blog by entering the admin panel from any one of various locations within the University website. For example, through http://portal.uv.es and selecting 'Blogs' in the 'University Services' tab. You can manage the blog from the menu on the left side of the screen and select a template from that menu under 'Appearance - Themes'. By adding posts, inserting pages, using multimedia files, etc., you can give form to your new blog. If our blog is obsolete and no longer want to use it, we can do that every user that tries to access the same be automatically redirected to another URL that you specify. To do this we'll activate the plugin 'Simple 301 Redirect'. Then in the administration menu click on the Settings (Settings) followed by the option '301 Redirect'. http://www.uv.is (it is an example of URL). After saving the changes, all users who enter the URL of our blog, you will be redirected to the URL specified. 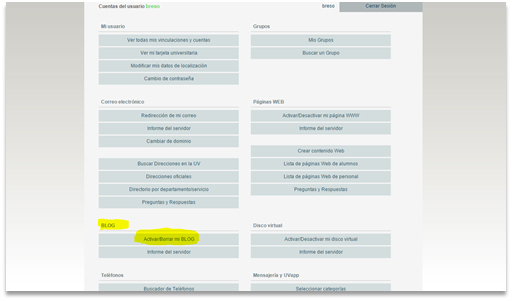 Each user can activate or deactivate their blog from http://cuentas.uv.es, where the operation is validated using their UV username and password and clicking the 'Activate/deactivate my blog' button. Below you can see a videotutorial (lasting 1 minute) on how to activate/disactivate a UV blog. http://user.blogs.uv.es, where 'user' is your username at the UV. In the case of group blogs 'user' is the name of the workgroup. Any user at the Universitat de València can have a blog associated with their account. Both staff (PAS administrative staff and PDI teaching staff) and students can obtain a blog space and manage it, with the commitment to include either personal or academic content. Users belonging to disco.uv.es working groups can also have a blog. This blog is managed by the users of the group. See 'Group blogs'.